Where once the choice for Chardonnay drinkers was either a big, buttery, oaky expression or, in response, an austere, lighter version, now producers have found an appealing middle ground, as Patrick Schmitt MW and fellow judges discover. No single variety of wine has suffered more abuse than Chardonnay. As those of you in the trade know well, the most overt sign of this came with the ‘Anything But Chardonnay’ movement of the last decade – shortened to ABC – which emerged as a response to buttery, oaky, rather sickly styles of wine that had appeared on the market from the late 1990s onwards, when heavy-handed cellar techniques were used on lightweight grapes. Unfortunately, it wrongly tarred all Chardonnays with the same brush. But the ABC sentiment was to some extent justified; it was a reaction to something real. As a result, combatting such an image issue took drastic, tangible measures. It required the emergence of ‘skinny’ Chardonnay: a style of wine created so lean that the trade and consumers couldn’t help but notice. It was proof that Chardonnay’s stylistic pendulum had well and truly swung to another extreme. And, for this reason, initially, it was welcome. But it wasn’t the long-term solution for a grape that had created a mass following for its richness. Should one crave a fresh, lightweight drink, one wouldn’t ask for a Chardonnay. So, while the lean Chardonnay showed that winemakers could produce something delicate from this grape, it was, at the same time, disappointing those who loved Chardonnay for its generosity; that crowd-pleasing combination of ripe yellow fruit and notes of buttered toast. In a crowded wine competition arena, The Drinks Business Global Chardonnay Masters stands out for its assessment of wines purely by grape variety rather than by region. Divided only by price bracket and, for ease of judging, whether the style was oaked or unoaked, the blind-tasting format allowed wines to be assessed without prejudice about their country of origin. The best wines were awarded medals which ranged from Bronze through to Gold, as well as Master, the ultimate accolade, given only to exceptional wines in the tasting. 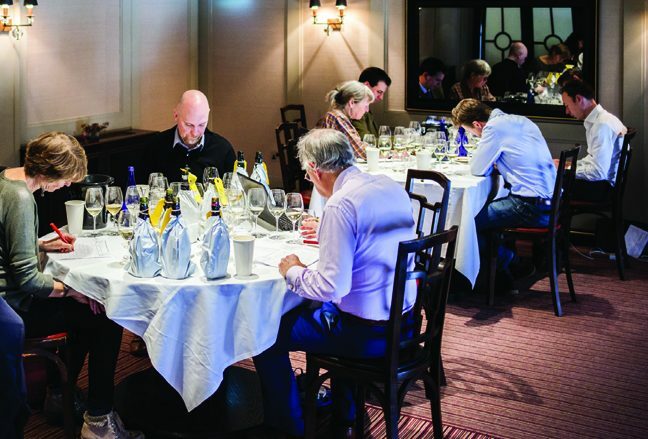 The wines, which were all 100% Chardonnay, were judged by a cherry-picked group of Masters of Wine and sommeliers on 12 October at Villandry in Piccadilly in London. This report only features the medal-winners. Moving forward to today, and following another extremely comprehensive Chardonnay sampling through our Global Masters programme, it is apparent that an appealing, balanced middleground has now been struck. One can still find the rich, oaky, Chardonnay caricatures, and the more feathery, austere examples too, but the extremes are less extreme. The variation now comes with price point – so, as one moves up the quality ladder, you can literally buy more fruit, oak, and layers of flavour, for the most part, in harmony. What’s important is that, in general terms, the Chardonnay on the market at the moment is better to drink than it has ever been before. And, with so many sources, there’s a lot to excite the adventurous drinker. All this means that, at present, any wine lover who is tired of Chardonnay, to paraphrase Samuel Johnson, is tired of life. With all that said, before looking closely at the high points from this year’s tasting, there is still controversy in the handling of Chardonnay by winemakers. In the vineyard, lower yields, and attempts to pick neither under- nor over-ripe may be producing musts with the potential for greatness, but management during and after fermentation is bringing a particular and divisive character to the resulting wines – and this results from differing levels of hydrogen sulphide (H2S). At low levels, this compound can add a complexing whiff of smoke, reminiscent of a freshly struck match. At higher concentrations, it can be stinky, like rotten eggs. Skilled winemakers can control the influence, mainly through lees management, and will allow the almost rampant production of the compound in some barrels, before blending these into the wine to a bring about a desired level of sulphide-sourced characters. Where they have been apparent, but not unpleasant, sulphidic aromas have been a shortcut to success in wine competitions. However, our judges are more sceptical of heaping high scores on such artefact. As a result, while the top medallists in the Chardonnay Masters may display an attractive sulphidic note, it is in combination with other flavours, primarily the character of the grapes, enhanced by the addition of aromas created by malolactic fermentation and barrel-ageing. In other words, our judges aren’t swayed by the instant aromatic smoky hit from sulphides, but are happy to reward this trait in well-made Chardonnay, as long as it is in harmony with other elements in the wine. On that note, it is important to stress that texture too is vital for great Chardonnay, and the judges were looking for a wine not just with flavour complexity, but a certain weight in the mouth from ripe fruit (not sugar or elevated alcohol). Not only that, but the oleaginous had to be balanced by a brightness on the finish – all wines must deliver refreshment, however weighty. So, there are no fewer than 37 Gold medals awarded. Out of curiosity, how many wines tasted in total? Unless the total of entries is in the hundreds ‘Gold’ has very little weight. Great summary of the current stae of Chardonnay. Particularly like the comments on sulphide-type aromas.